The 16th Gyalwa Karmapa, Rangjung Rigpe Dorje (1924-1981), was one of the 20th century’s greatest spiritual masters and was highly venerated by teachers and disciples in all Buddhist traditions. Following the 1959 Chinese invasion of Tibet, as head of the Karma Kagyü tradition of Tibetan Buddhism, he went into exile in India. From his new home in Sikkim, as well as during his later extended voyages to the West, the Karmapa contributed immensely to the worldwide flourishing of the Buddha’s teachings like few other teachers. With his warmth of heart, his spiritual power and not least his openhearted humor, he moved people to their deepest core and overcame all cultural and social boundaries. Karmapa touched and inspired people from many different spiritual and religious traditions who were interested in inner development, including even those who feared or were critical of religion. His radiant compassion affected all who were fortunate enough to meet him. In this book Gerd Bausch traces the life of this great Kagyü master who effortlessly pushed the boundaries of the human imagination and provided people with a new outlook. Literally day and night, the 16th Karmapa tirelessly assisted everyone who asked for his advice and help, welcoming all with infinite generosity. In addition to accessing other contemporary sources, Bausch conducted close to eighty interviews through records the first-hand experiences related by many of the fortunate people who encountered this extraordinary master. Publication date was Nov 27, 2018. You can order it here. 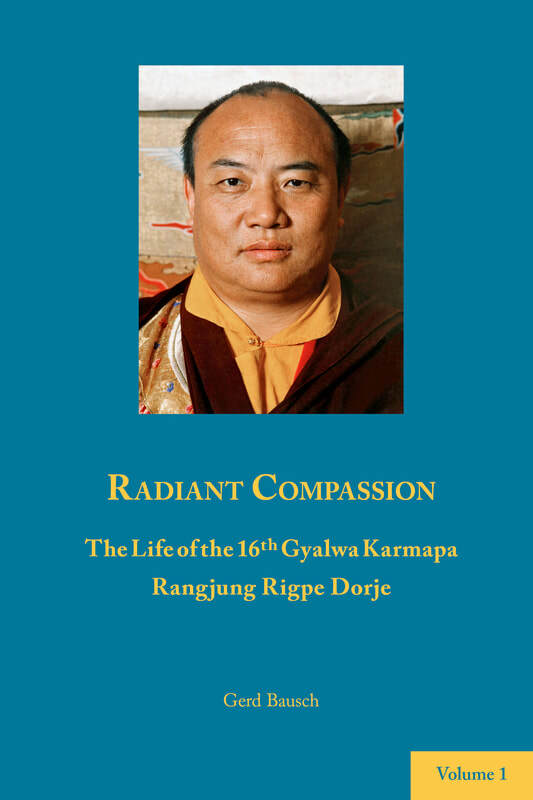 Thank you for your support in making Radiant Compassion--The Life of the 16th Gyalwa Karmapa Rangjung Rigpe Dorje possible. 384 pags & 8 color pages, hardcover. for extracts of the book, please click here. Although every picture or film I saw of the 16th Karmapa inspired me deeply, I did not initially intend or even dare to write a book about his life, but instead had planned to publish the life history told by his attendant Lama Tsültrim Namgyal, and to add to this account some interviews with more of Karmapa’s students. In 2010, when I started working on this book – almost thirty years after his death – no biography had been written. I had already gathered so much interesting information with my interviews and other sources that when my first idea proved to be unrealistic, I decided to compile an account of this master’s life. Since the first time I saw his photo in a temple, he completely fascinated me, though I lacked the good fortune to meet him in his 16th incarnation. In my efforts over the years to collect material and interview students of the 16th Gyalwa Karmapa, the community of practitioners (in Sanskrit called Sangha*) fortunately helped me a great deal: Assistance came from everywhere. Without the wholehearted support of those admirable people, this book would have remained only fragmentary. The book is based on more than eighty interviews in India, Nepal, France, Germany and Spain, as well as by telephone. From great masters such as His Holiness Sakya Trizin Rinpoche, head of one of Tibetan Buddhism’s four major schools, to ‘simple’ practitioners, people shared stories of their encounters with the great master. Given the subjectivity of the interviews, they provide only a small and very personal impression of the 16th Karmapa. I nonetheless feel that this limited perspective in no way trivializes the Gyalwa Karmapa’s life and activity. Precisely because those who contributed their recollections share their subjective perceptions, we can form an impression of what the 16th Karmapa was able to awaken in people. To some extent the book’s style reflects the Karmapa’s life: Like his traditional training and activity in Tibet, the first chapter reads like a namthar, a traditional biography, a ‘liberation story’. In exile and in the West, the 16th Karmapa’s activity gradually developed in cultures that were new to him, but to which he responded like water that adapts to any environment. As his activity unfolds and becomes increasingly varied, the book’s structure also changes: More and more individuals who were lucky enough to have met Rigpe Dorje describe their experiences with him. The first volume ends with Karmapa’s first journey to the West. The second volume describes the rest of his life, his Parinirvāṇa and his cremation, and deepens some themes introduced briefly in the biography and the interviews. In the final section, the 16th Karmapa speaks himself, with some instructions and vajra songs. The first Volume of the book in German (Gerd Bausch: Strahlendes Mitgefühl, Edition Karuna) was published in December 2016. You can read extracts of it here and order it here.